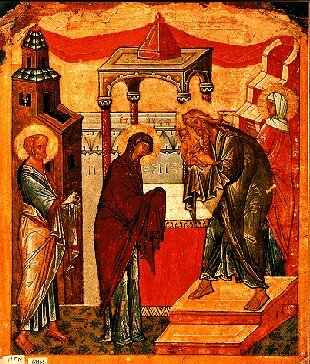 On the 2nd of February, our Holy Church celebrates the Feast of the Presentation of Christ to the Temple. The Church also refers to this Feast as the Synaxis (or meeting) of our Lord in the temple. In accordance with the Mosaic law, 40 days after the birth of a male child the mother is required to present the child in the tabernacle and offer as a sacrifice either a lamb or a pair of doves or pigeons for her purification. The presentation of a first-born son also signified redemption or buying back, for all first-born creatures (both humans and animals) were considered to belong to God. Imagine this blessed scene, of an old man - barely able to hold himself upright due to his advanced years- fully attired in the Traditional clothing of the High Priest of the Temple, cradling the infant Jesus in his arms. It is the meeting of the Old Testament Priesthood in the Temple with the New Testament Priesthood in Christ. And hence the naming of this Feast day as the "Synaxis" or Meeting of our Lord in the Temple. "My eyes have seen your salvation, now let your servant depart in peace".